Charles F. Howlett is professor of Education Emeritus at Molloy College. To celebrate Women’s History Month, the television quiz show Jeopardy, recently posted a category related to female historical figures. The contestants, sharp, enthusiastic, and knowledgeable, answered all the questions in that category, except for one. When host Alex Trebek asked, “Who was the first female doctor in the United States,” all three contestants failed to press their buzzers. Trebek looked at them skeptically and simply said, “Elizabeth Blackwell. While the contestants surely would have immediately recognized the names of Sojourner Truth, Susan B. Anthony, Harriet Tubman, Harriet Beecher Stowe, Florence Nightingale, Jane Addams, Coretta Scott King, Amelia Earhart, and Marie Curie, for example, I wondered why none of the contestants even thought to take a guess. 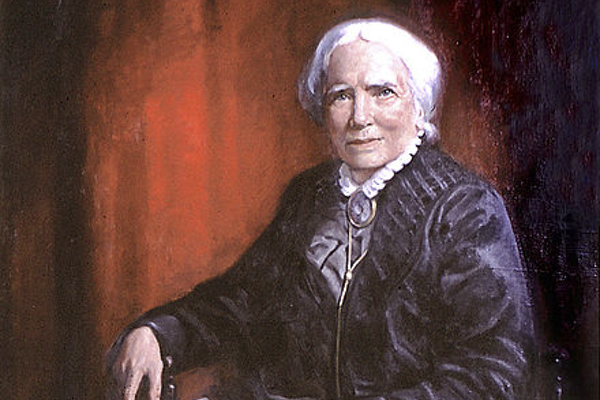 Thef act that Elizabeth Blackwell was the U.S.’s first female doctor is certainly worthy of recognition. What is far more important is what she did. She was a pioneer in fostering the role of women in medicine both in the United States and Great Britain. In the United States, she founded in New York City an infirmary for poor women and children, during the American Civil War she provided invaluable assistance combatting infectious diseases and treating the sick and wounded for the Union cause under the jurisdiction of the United States Sanitary Commission, and prior to returning to England she established a medical college for the training of female physicians. In Great Britain she duplicated these efforts where she led the way with the formation of the National Health Society as well as the London School of Medicine for Women where she served as professor of gynecology from 1875 to 1907. Why she did not receive the recognition she deserved during her lifetime and afterwards until the second half of the twentieth century is due in large measure to the profession she chose, which until recent times believed that women were better suited as nurses and not physicians. But perhaps more importantly, when rejected for hospital positions, she used her skills as a teacher to become not only the nation’s first female physician but also its first female professor of medicine. Very, very few know about the latter. Blackwell was born on February 3, 1821 in Bristol, England, the third of nine children. Her father, Samuel, was a devout Quaker and one of the founders of the Bristol Abolition Society. Her subsequent social activism, especially her anti-slavery views, as an adult was greatly influenced by her father’s beliefs. During the Bristol Riots of 1831, Samuel’s small sugar business was destroyed by fire. Disillusioned and nearly destitute he relocated his family to the United States where he established a new refinery in New York City. However, the Panic of 1837 hit his business hard,and in 1838 he moved his family to Cincinnati in order to re-establish his business. Three months after arriving in the QueenCity, Samuel died leaving his family destitute. Determined to survive Elizabeth, along with her mother and two older sisters, started a small private school. Later Elizabeth also taught in Kentucky and North Carolina. While she was working as a school teacher, she was drawn to the field of medicine. In 1845, she began reading medical books under the direction of Dr. John Dickson of Asheville, North Carolina and his brother, Dr. Henry Dickson of Charleston, South Carolina. What drew her into the study of medicine was her friendship to another woman who was suffering from a terminal illness; her friend expressed to her how embarrassed she felt going to male doctors and it was her wish that someday there would be female physicians better able to relate to her personal feelings as a woman. Determined to learn more with regards to medical treatment for women, in particular, in 1846 she applied to medical schools in New York City and Philadelphia, only to be rejected because of her gender. Finally, in 1847, Geneva Medical School, a small medical school in upstate New York, gave her a chance. She did not disappoint, finishing at the top ofher otherwise all-male graduating class. While attending classes she was largely ostracized and made to feel unwanted. She received her medical degree in January 1849. Perhaps because of her own family struggles, she chose to work briefly with patients at a Philadelphia alms house, an experience that provided her with a considerable amount of knowledge in the study of epidemiology. Curious to learn more about this field she moved back to England in April of that year, where she worked under Dr. James Paget in London. There, she developed a close relationship with Florence Nightingale and Elizabeth Anderson, pioneers in professional nursing and women’s health care in Great Britain. Paget became a leader in the study of women’s breast cancer (a form of the disease is named after him); Nightingale and Anderson were attracted to Blackwell because of her work with Paget and her interest in larger medical issues such as childbirth (she briefly went to Paris and studied at La Maternite) and infectious or communicable diseases. Returning to America in the summer of 1851, she was denied positions in New York City’s hospitals. In part this was due to her contracting a disease during a procedure on an infant that led to blindness in one eye while studying Midwifery in Europe. Her career as a surgeon was over but why she was not hired to teach at one of these hospitals is troubling. Nonetheless, by this time her sister, Emily, also had a medical degree, and the Blackwell sisters together with Dr. Marie Zakrzewska, established the New York Infirmary forI ndigent Women and Children. This infirmary took the lead in presenting important lectures on hygiene and preventive medicine, including the training and placement of sanitary workers in the city’s poor areas. As a former schoolteacher, Blackwell was well suited for the job. With the outbreak of the American Civil War in 1861, Blackwell rallied other female reformers to establish the Women’s Central Relief Association in New York City to train nurses for the Union Army. Her motivation and commitment to the Union cause grew out of her own anti-slavery beliefs. Providing medical aid and comfort was her way of upholding her Quaker beliefs while sustaining her support for the Union. The association quickly became part of the United States Sanitary Commission (USSC), a private relief agency to assist the sick and wounded. With Blackwell in the forefront many women were trained and began serving on hospital ships and as army nurses and sanitary relief workers. Working hand-in-hand with USCC, Blackwell orchestrated the building and running of hospitals and soldiers’ lodging houses and devised a communication system that delivered letters and telegrams to men in the field. In 1868, she and her sister Emily established the Women’s Medical College of the New York Infirmary where she served as a professor of hygiene. The next year she decided to return to England where she would reside permanently. In large measure this was due to previous conversations she had with Nightingale, who had expressed to her the need to establish a medical college for women like she had done in the United States. Given that England was now a mature urban-industrialized society, whereas the United States was just beginning to experience the transition from agrarian to industrial, England offered Blackwell more opportunities to explore national health issues on a grander scale. Upon her return she helped form the National Health Society, designed to educate citizens on the importance of health and hygiene issues and founded the London School of Medicine for Women. During her remaining years—she died at her home in Hasting sin Sussex on May 31, 1910--Blackwel lextended her outreach to promoting municipal reform co-op communities, prisoner rehabilitation, and the Garden City movement—a method of urban planning begun by Sir Ebenezer Howard designed as planned self-contained communities surrounded by lush “greenbelts that provided for areas of residences, industry workplaces, and agriculture." Her humanitarian reform efforts went beyond medical treatment and education, although it is fair to state that she considered these attempts part of her professional obligation. Although Jeopardy may have acquainted millions of viewers with Blackwell’s occupation on this show it falls far short of calling attention to her many achievements as a leading female figure. Simply remembering her as the country’s first female doctor shortchanges her numerous contributions to women’s history in the United States and Britain. She remains a heroine for her pioneering research into female health issues, as a teacher, for establishing medical schools for women in the United States and Great Britain, and for risking her own health and welfare when volunteering her services to assist sick and wounded Union soldiers. As a humanitarian she also deployed her medical expertise to help indigent women and children by building infirmaries and developing local and national health agencies associated with the growing complexities confronting nineteenth century urban-industrialized societies. Her humanitarian contributions, moreover, led to her association with urban reform efforts in the twilight of her career. Yes there are reminders of her place in history. There is a statue of her on the lawn at Hobart and Smith College (formerly Geneva Medical College), an 18 cent postage stamp dedicated in her honor in 1974, a 2003 historical marker established by the Ohio Historical Society, scholarly works about her life as a physician and inclusion in the National Women’s Hall of Fame, and the Elizabeth Blackwell Medal presented by the American Medical Women’s Association —the award was officially established in 1958. Although she became a naturalized U.S. citizen, furthermore, she is also the first woman admitted to the British Medical Register permitting her to practice medicine in the United Kingdom. Yet it is still very puzzling why she is not generally known among the populace at large. Just witness the Jeopardy contestants. What needs to be done is to give her greater exposure in our secondary social studies textbooks and teaching. Include a description of her many accomplishments along with a photo caption that reads: “Elizabeth Blackwell, Physician, Heroine, Humanitarian, and Teacher.” What may very well capture the students’ attention is the “teacher” description. That is the one aspect of her life which has received the least attention. Yet it could be her most valuable contribution to the study of women’s history. After all, she used that skill to inspire women against difficult odds to follow in her footsteps. Now it is up to textbook publishers and schoolteachers to give Blackwell her just due.